After Capitol Reef, we drove a comparatively uneventful 2.5 hours east to Moab, Utah, our base for exploring Arches and Canyonlands National Parks. 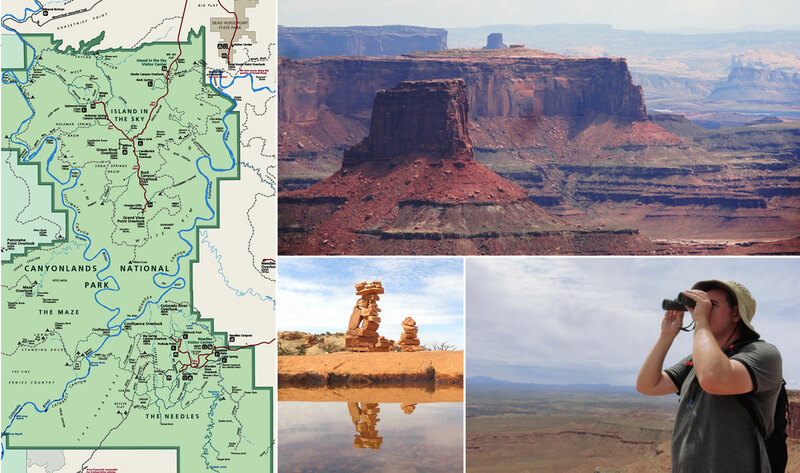 With about 6,000 residents, Moab was the largest town we’d seen since passing through Durango, Colorado five days earlier, it was positively bustling in comparison to Mexican Hat and Torrey. It is a tourism hot spot, known for mountain biking, Jeep off-roading, and any outdoor activity you can think of. Moab is also home to one of our favorite lodgings of the trip, Inca Inn. When in far off places we always love a good “mom & pop” motel and this one didn’t disappoint. The free breakfast and outdoor pool were nice, but they also thought of the little things that matter when traveling, like outlets. Why don’t more hotels just install 6-outlet adapters? Finally we didn’t have to climb under tables of move the bed to charge our many electronic devices we use during the day. They also get bonus points for installing disco LED shower heads, a random and fun surprise. Since we arrived in mid-afternoon and hadn’t had lunch because of a large breakfast at the Rim Rock Inn restaurant, we just needed a little something to eat, so headed to Peace Tree Juice Cafe for a light lunch and smoothies, the Desert Nectar was amazing. With three nights booked at the Inca Inn, we decided it best to spend a full day in each national park and visit nearby Dead Horse Point State Park on this first evening in town. Dead Horse is a small but spectacular point of land overlooking the Colorado river just upstream from the more famous Canyonlands National Park. It’s about 40 minutes from Moab along the same route that leads to Canyonlands. Dead Horse Point is a great preview to the area landscape and geology, being kind of a mini version of the enormous Island in the Sky district of the national park visible across a canyon to the west. The park is popular with mountain bikers and has several miles of hiking trails, but we stuck to the short trails to viewpoints with our limited time before the sun went down. On the way to the tip of the park, the road crosses a neck of land that is barely wider than the road itself. The tip of Dead Horse Point offers nearly 360 degree views into the never-ending landscape of layered red rock. 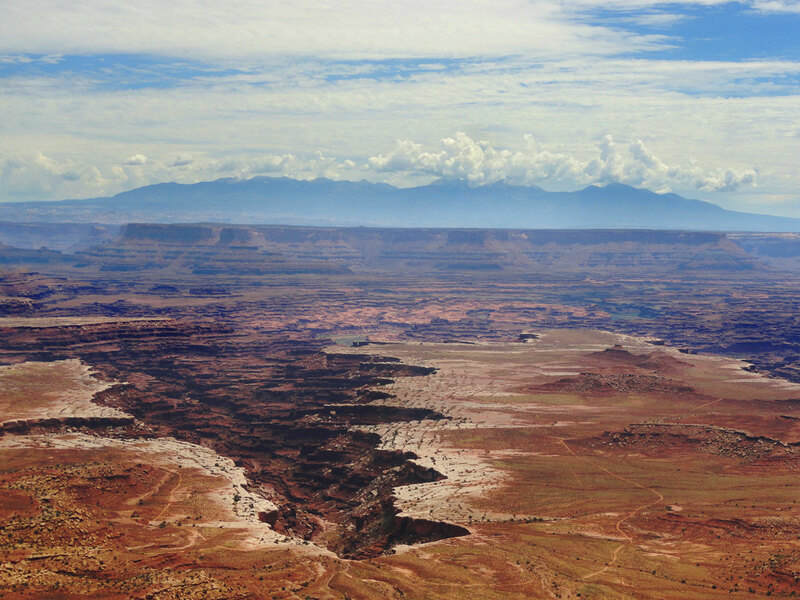 One important note is that the Colorado River is visible from most of the park’s vantage points, while it is hidden from view in a deep crevasse from Canyonlands. The whole area bears a resemblance to the Grand Canyon, so it’s no surprise that the famous flying car scene from the 1992 movie Thelma and Lousie was filmed here, rather than Arizona. Apparently it’s easier to get permission to drive a car off a cliff in a state park than a national park. 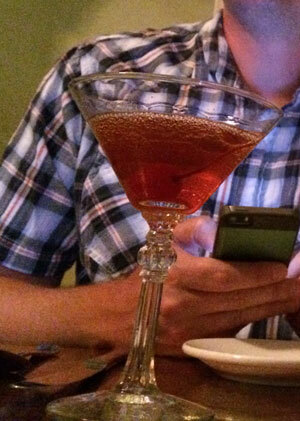 Back in Moab, we enjoyed dinner at Moab Brewing, but were again confounded by those western state booze laws. Beer brewed by a brewery/restaurant and served it its very own building can’t be above 3.2%, but they are allowed to can the more potent version of the same beers and sell them from a separate kiosk in the front of the store. Just plan on being sober in Utah. Upheaval Dome viewed from the overlook trail. The next day was our full day dedicated to Canyonlands National Park. This park is fairly undeveloped, with only a small visitor center near the entrance and no food services. You can fill your water bottles at the visitor center, but plan to pack in a picnic. We did some research and found the Love Muffin Cafe in town opens early and makes great lunches to go. Canyonlands is an enormous park by area, the largest one we’d visit on this trip, but receives less than half as many visitors as Arches right next door so there’s never a crowd. There are three main sections of the park to consider, Island in the Sky, The Needles and The Maze. The different districts are separated by rivers and thus not connected by road or trail, so visiting more than one realistically requires more than one day. We spent our time at Island in the Sky, the most accessible and popular section. It is a large flat plateau rising up to 2,200 feet above the Colorado and Green Rivers with a maze of river-carved canyons, cliffs, buttes, fins and spires as far as you can see in every direction. We started with the introductory movie and some ranger advice at the visitor center. 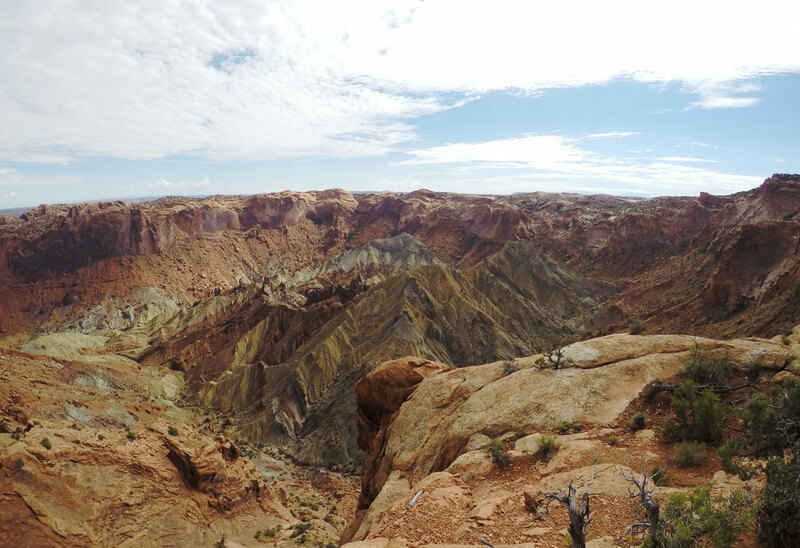 Our first stop was the crazy geologic feature called Upheaval Dome, a 3 mile wide circular remnant of a meteor impact about 12 miles inside the park entrance. Centuries of erosion have exposed layers of upturned rock radiating out from the center. The 8.4 mile Syncline Loop Trail circumnavigates the formation and allows access into its center. The trail sounds awesome, but it is primitive and unmaintained with some pretty intense elevation changes and boulder scrambling. Combine that with a July temperature in the 90s and the complete lack of shade, and we knew it wasn’t meant to be. We instead kept our hiking to the Upheaval Dome overlook trail, a 2 mile round trip that leads to two spectacular viewpoints above the crater. Even after this shorter, less strenuous hike we were sweaty messes because of the intense sun. In the summer months, several short hikes is a good way to go, with air conditioned car rides in between viewpoints to cool off. A spring or fall visit would allow longer trail excursions. View from Grand View Point, the tip of Island in the Sky. Next down the road we hit the Green River Overlook viewpoint, which probably has the most classic Canyonlands views in the area. The Green River is visible far below, as well as many of the park’s rock formations and even the Henry Mountains more than 50 miles distant. There’s no hiking here, but it’s a great place for photos. Continuing to the south along Grand View Point Road takes you along the increasingly narrow finger of land until you reach Grand View Point, where Island in the Sky basically hits a dead end. We parked at the end of the road and continued on foot along the Grand View Point Trail to the very tip of the plateau, where we stood on a rock with sheer 1,200 foot cliffs on all sides. At this point, the immense scale of the park is most apparent. The Needles district is visible in the distance, but it would take more than two hours to get there by car. The Maze district is also over there somewhere, but it’s so inaccessible I don’t even know how long it takes to get there. Heading back toward the park entrance, we stopped for our picnic lunch under the shade structures just north of Grand View. Feeling replenished we had two more sites to visit before returning to Moab. Mesa Arch is a Canyonlands must-see. An easy quarter mile walk leads to the wide natural arch that frames views of jagged canyons, Washerwoman Arch and the distant LaSal Mountains. It’s especially popular with photographers in the morning as the rising sun reflects an intense orange glow along its underside. Further along, the Shafer Canyon Overlook gave us the reverse view of what we had seen the previous day, with Dead Horse Point visible across the canyon. Those in four wheel drive vehicles can take the unpaved Shafer Canyon Road back to Moab from near here, but we’d subjected the little Mazda3 to enough off-roading already and took the normal route back to Moab. Canyon lands is really a park that is worthy of multiple days or future visits, the strange mazes of never-ending canyons never get old. We could return and go to the Needles and have a completely different experience than we had at Island in the Sky. 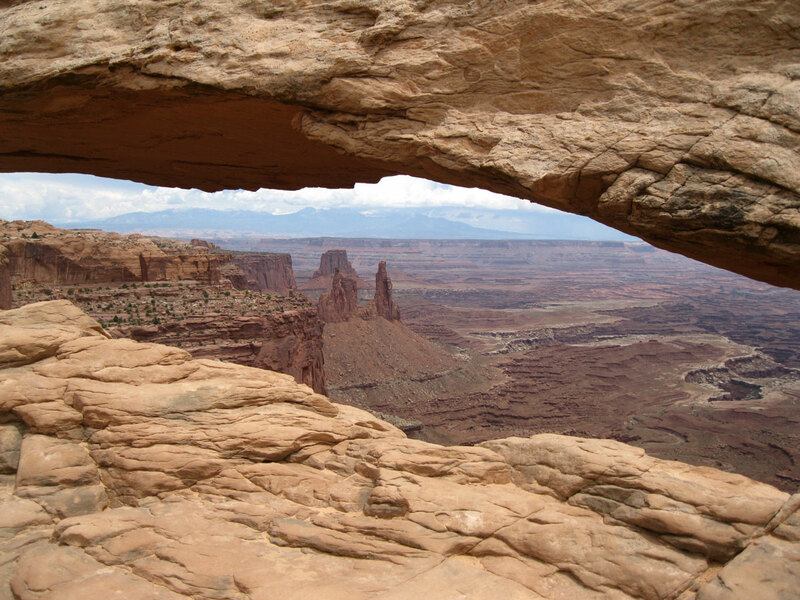 The view through Mesa Arch, Island in the Sky district. Reaching the mid-point of the trip, we knew we’d be in need of fresh clothes, an important packing consideration when traveling for more than a couple weeks. A pre-departure google search led us to Moab Laundry Express, with two locations in town and giant machines that can wash a couple weeks worth of clothes in one load. An exceptionally friendly local provided advice on appropriate settings (the high heat dryer setting is WAY TOO HOT), and we left all freshened for the next week and a half. That evening we treated ourselves to dinner at one of the more upscale restaurants in Moab, Jeffrey’s Steakhouse. Located in a historic stone house a block off the busy tourist main street, Jeffrey’s offers a wide variety of modern dishes and a full wine and cocktail list. Their specialty is American Waygu Beef sourced from a Nebraska farm. Everything we had was delicious, the service was top notch and they’re conveniently on Opentable for easy reservations. After dinner we climbed the stairs and finished off the evening with cocktails in the attic Ghost Bar, a tiny lounge serving classic cocktails and wine. We made it an early night as we had some pre-dawn plans in Arches National Park, but left Jeffrey’s fat and satisfied at finally having found some worthy Utah cocktails.